Manchester, summer 1968, finds little Johnny Maher, almost five years old, staring through the window of Emily’s corner shop – as he did whenever he and Mum passed – at the small wooden guitar among the mops, buckets and brooms. Finally Mum bought it for him. Just 14 years later, he founded the much-loved indie rock band The Smiths, one of Manchester’s finest. “I have no idea if music is something that you’re born with or is bred into you, but the fascination I had with music was completely personal and natural,” Maher – now Marr – writes. For him, music became “another dimension, one that made more sense to me than the world I actually lived in”. The meat of his book for rock music lovers is undoubtedly the brief five years when The Smiths held sway, from 1982 to 1987. The band was incredibly prolific – over 70 songs in such a short career. Although they made just four albums, three of them are among Rolling Stone magazine’s 500 Greatest Albums, and they were considered the superlative alternative rock band in Britain in the 1980s. 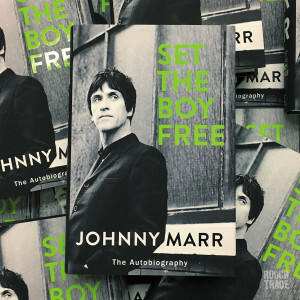 From his working-class background – toilet in the back yard, tin-tub bath hanging on the wall – and Irish heritage, Marr taught himself the guitar and went through some adolescent bands before forming The Smiths. He was tipped off about an eccentric bloke called Morrissey as a potential singer, so took the simple route of knocking on his door and asking if he wanted to form a band. The story wasn’t quite over. In 1989 drummer Mike Joyce and bassist Andy Rourke took legal action because Morrissey and Marr had each taken 40% of the Smiths’ recording and performance royalties. The denouement – read about it – led to Morissey’s declaration that he would rather eat his own testicles than reform the band. Marr presents telling anecdotes from his childhood that show the inescapable allure music held for him. Post-Smiths he played with Bryan Ferry, the Talking Heads and others, and was in Electronic, The Pretenders, The The, Modest Mouse and the Cribs. The antithesis of the wildly soloing “guitar hero”, Marr is known for melodicism and he employs a similarly clean and uncluttered writing style.